Hello fellow Foodies. If you like burgers and beans, have I got a treat for you! I’m talking REAL burgers, and not that fast pseudo-food junk. Typically I pre-make a whole bunch of burgers from scratch and then freeze individual ¼ pound patties by wrapping each one in both wax paper and aluminum foil. I find that this helps to eliminate freezer burn, and allows you to pull out of the freezer exactly the amount of burgers that you want without waste. My burger patties are a secret concoction, but for you I am willing to un-secretize them. They are roughly half lean ground beef and half lean ground pork. I add a bunch of chopped raw onion, several healthy shakes of garlic powder and ground cayenne pepper, followed by some oatmeal and eggs to hold the whole mixture together. The last time I did this, 30 burger patties headed for the freezer, so it’s a big job. However, I also don’t have to make them that often, and I’ve always got an awesome burger when I want it. Today I grilled three burgers and a package of four Marc Angelo’s Hot Italian pork sausages. I generously basted the burgers and sausages with Bull’s-Eye Hot Southern Cajun Barbeque Sauce. While they were cooking, I started chopping my veggies. I used one whole raw onion, one whole green pepper, one small hot red pepper that came from a friend’s garden (I have no idea what it was), one dehydrated Habanero pepper (if you can’t handle the spice, you may want to skip this ingredient), and about half a pound of chopped fresh mushrooms. Once the grilling was done, I sliced the four sausages into thin slices, and added them to the veggie mix. To that I stirred in two 398 ml (14 oz) cans of Heinz Chipotle BBQ Style beans and mixed the whole concoction together. 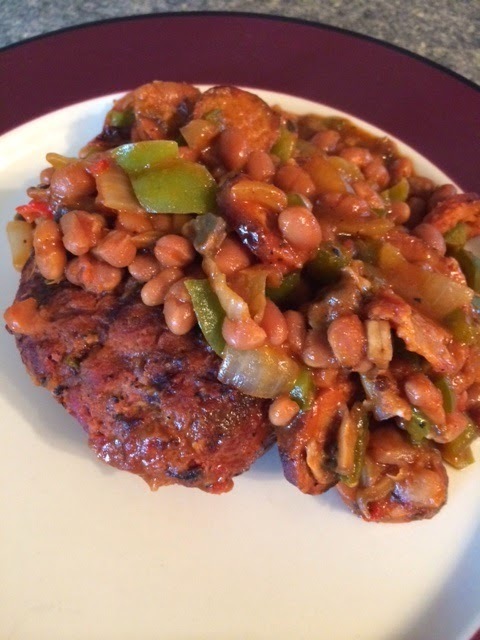 Finally I took my three grilled burgers, put them in an oven-proof casserole dish, and poured the veggie and bean mixture overtop. After wrapping the dish in aluminum foil, I let it all cook together in a 300 degree oven for about 30-40 minutes. Well there you have it, fellow Foodies; Will’s soon-to-be famous Burgers ‘n Beans. Eat your heart out, Weight-Watchers! Sometimes you have to live a little and blow the diet, although the calorie count probably isn't that bad.